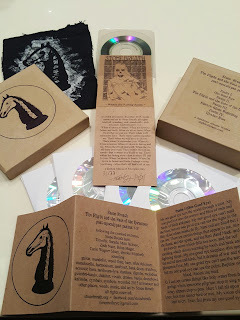 January 6, 2016 we released this limited 4 x 3" CDr box set, The Flight and Fate of the Horsemen. As promised, we kept the music exclusive to the box set for one year and one day. On January 7, 2017 we will make this release available for digital download on our bandcamp page. At that time, we will cease to make any further physical copies. We will sell whatever we have on hand, and that will be the end of the physical edition. There's still time to get a copy of the box set! Order from Dark Holler Arts. This box set was created to help fund the two albums we were working on throughout 2016: CRYPTIDS and WITCH TREE PROPHETS (forthcoming). Happy holidays and a happy New Year to all.